On their 3rd LP for Poland’s Bocian Records, the Zeitkratzer Ensemble directed by Reinhold Friedl yield two knife-edge pieces recorded live at Haus der Kulturen der Welt, Berlin, January 17th, 2016. A-side is a performance of Gilles Sivilotto’s Handmade 02, meaning a 15 minute transition from sleigh bells and arrhythmic string scrapes into structuring, creaking rhythms and banks of atonal clangour, developing into a serious caterwaul akin to a busy factory cosign to the end of its day. 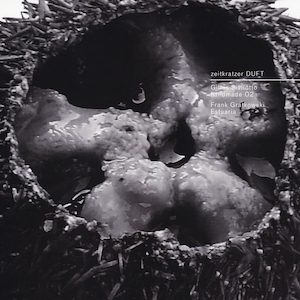 The other side documents their take on Frank Gratkowski’s Estuaria, which initially works in stark contrast to the eruptions of the other piece with floor-skimming bass strings and a hazy film of woodwind oscillating in slow waves to doomy effect, joined by prickling horror score motifs which precipitate a hellish plague of strangled voices and teeth-jarring, hi-register squall that ultimately melts back into the ether as quietly as it emerged. Zeitkratzer, under the direction of Reinhold Friedl with Frank Gratkowski, clarinets, Hild Sofie Tafjord, French horn, Hilary Jeffery, trombone, Reinhold Friedl, piano, Maurice de Martin, drums, Lisa Marie Landgraf, violin, Burkhard Schlothauer, violin, Nora Krahl, violoncello, Ulrich Phillipp, doublebass.